Regular duty 10° Quick Change gears for the Casale split case v-drive. Regular duty 12° Quick Change gears for the Casale split case v-drive. Lightened Regular duty 12° Quick Change gears for the Casale split case v-drive. 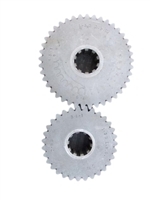 Casale C-500 Press-On Double Angle Gears.